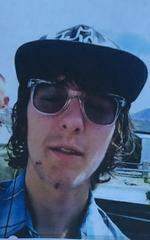 The Kern County Sheriff’s Office is asking the public’s assistance in locating Matthew Gladish. Gladish was last seen outside his home in Lake Isabella on May 12th, 2016. He has no history of running away and recently moved to the area several months ago. He is from the Yucca Valley, and has friends in that area. He wears prescription glasses with a clear frame and red temple/ear pieces. If anyone has information on his whereabouts they are asked to call Detective Dustin Contreras at 661-861-3110 or Secret Witness at 661-322-4040.